Nothing defines the architecture of a space more than mouldings, and no moulding can define your creative expression more than Lancrest products can. Transform an ordinary space into an extraordinary room, Convert an unremarkable home into an elegant estate. Whether its residential or commercial Our designs, inspired by the architecture of ancient Europe and Rome, by the history of Greek revival and the Italian renaissance, feature our own unique interpretations of the timeless beauty represented by each of these periods. Using our product line as your guide, we welcome you to choose from an extensive array of fine accents such as Cornice, Crown chair rails, ceiling medallions, corbels, and door surrounds. Feel free to combine and match mouldings to create something uniquely yours, with Lancrest, your imagination is your only limitation. 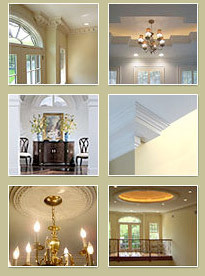 Please browse through our online catalog to discover how LANCREST Mouldings fits into your project.